This week we made shortbread cookies. Sure it doesn't have an exciting name like TKO or Better Nutter but this humble, simple recipe shines. For a beginning baker especially, this is a great recipe to start with as it foolproof. Just a couple of notes, one being that the dough has to chill for at least an hour and second that it is a little crumbly when rolling out but not difficult to work with. These cookies got a resounding Yes! from all the bakers. See what each of them had to say below. I was looking forward to this week's recipe, shortbread, since it seemed less involved and more simple than past weeks. Again, I used Straus European style butter, sine there are so few ingredients in this recipe, I knew the butter had to stand out. I made the dough easily enough, it was very shaggy and crumbly. I divided it in two parts, as I did with the previous recipe, so make it easier to roll out later. After chilling for 2 hours, I started to roll it out. The dough was very crumbly and difficult to roll out. Even though I followed the instructions and pounded the dough before rolling, it still cracked and broke off into pieces. It was quite frustrating. There was no way I could manage the dough into a rectangle, so I did my best and cut out rounds instead. I got 6 three inch rounds and 18 two inch rounds. The cookies taste delicious, and I especially like the sprinkling of sugar on top. After sampling them plain, I decided to jazz them up, so I dipped them in melted white chocolate and added some colorful sprinkles. These would be great cut into shapes and decorated. I made the dough first thing in the morning before I left for the day. Used my Kitchen Aid mixer, and it all came together as written. No surprises. I must say that I am quite good at creaming butter now, thanks to the previous recipes. Finished procedure, left in frig for the day. Departed from the book a bit. 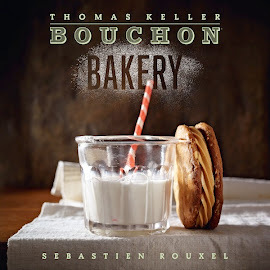 So, I have had the great pleasure to have worked this past year with of the most talented bakers in this city. Jen and her crew at Batter Bakery. For nearly a year, I have watched them roll out shortbread and yesterday I paid close attention. I have the exact same granite counter they have. Jen uses a little flour on the work surface, as well as just a dusting on the roller, of which I have the same exact roller. So, instead of rolling between parchment paper and all that nonsense, I did what the pro's did. Rolled right onto the counter. Very hard at first, but started giving way after some pounding, and a bit of rolling. As you can see from my pics, I squared it off exactly 9x9. I measured and cut shapes to size. This technique was so much easier than parchment or plastic wrap. The cookies come off easily, and was able to get them right onto the cookie sheet into the oven. I have been using silpats. I am happy with the results except for one thing. I wish instead of the granulated sugar, I had used a coarser sugar. Truth be told, I have for the last year, been eating the best shortbread in the entire world, so I found myself comparing a little too much to what I really like. Going forward....This is an easy recipe that can be done ahead of time. I prefer lavender sea salt shortbread that Batter Bakery is famous for, and will try that next time. My skills rolling out shortbread still need some work, as well as rolling evenly. I will make this again. This is one of those cookies that's dangerous to have around while you're alone because they are so buttery and delicious, it's impossible to just have one. I mean I'd have to say the serving size is at least 3 because that's how many I ate right after they cooled and many more after. I agree with the others in that the dough is crumbly but any cracks that formed, I simply pressed back together. The edges remained crumbly as I rolled out the dough but once I got the shape I needed, I pat the crumbs back into the side. Instead of cutting the rectangles with a knife I used a pie wheel. It was much easier. As far as taste, you can't substitute the flavor of real butter. Since there are only five ingredients in this recipe, you can really appreciate each component when you eat a cookie. It's nice to get back to something simple like this after the complexity of the Better Nutters and TKO's. The only change I'd make is using a coarser sugar for the top for more crunch. When I think of shortbread, I think medieval times. Years ago,when I attended the annual Renaissance Festival in the North Bay, shortbread was first on my list to eat even before the turkey drumstick. This was actually the action item on my list before doing anything. So here we are at week five, a cookie I never thought of baking because I thought they may end up in ruins. Hail to the Shortbread! This was a very enjoyable cookie to make. It was easy, quick and fun to make. I started the dough at 11p.m. Saturday.The dough was crumbly but not difficult to work with. Instead of rolling the mound into a 5 inch square, I went ahead and rolled it out to the final 9 inch square so that I didn't have to pound the dough and wake the neighbors up at 6 a.m the next morning. I used the pastry scraper to straighten the edges of the dough as well as I could. The dough crumbled a bit but I already knew the routine. The edges were not perfect but I liked that rustic look. I scored the dough to the specified measurements and refrigerated it overnight. Feeling refreshed the next morning; all bright eyed and bushy tailed, I dusted the dough with sugar then cut to 2 1/4 x 1 1/2 pieces and placed them on the silpat and baked for 12 minutes in a convection oven. After taking them out, I noticed the corners on some of the shortbread were browned. They still looked delicious anyway; And they were! I love the crunch and how they crumble. The sugar makes this a magical cookie. I will definitely make them again and again. Although this picture is not the best photo, it is the only proof I made the shortbread.. we've eaten them all. I used all recommended measurements, except for the salt; I used only 1/2 tsp. of kosher salt for the recipe and it was just right! Had difficulties rolling out the dough, it was very flaky. I need to invest in a marble rolling pin and board. I baked the shortbread in a conventional oven, so the dough spread a bit. 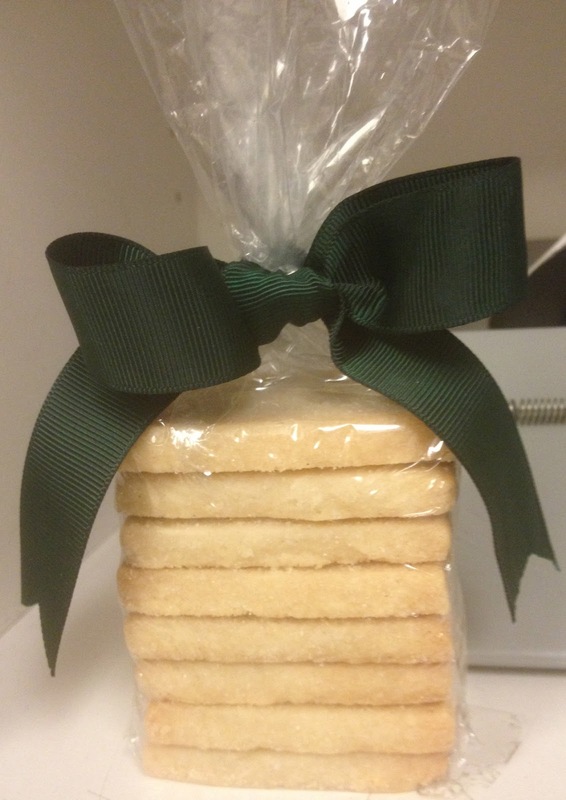 I cut my shortbread 2" x 4" in size; as it is one of my favorite cookie/biscuit- made total of 8. My boyfriend says it was perfect, tasted like a "walkers". I hope you enjoy making these at home for your loved ones. This recipe was very easy to make and I will be baking them again very soon! I again used Plugra butter and Nielson-Massey Vanilla paste for their amazing flavor. I must be honest and confess to you that I was running out of time and did indeed ask a coworker Karina to roll them out and bake them for me. If I ever run for president of the Baking Club I don't want this incident to sully my reputation. Baking has brought bake a lot of sweet memories (pun intended) and these shortbread cookies were no exception. A wave of nostalgia swept over me as I bit in to each buttery bite. Growing up in Upstate NY we had a neighbor, Mrs. Parr who made the most amazing Scottish Shortbread Cookies. I recall my first having them at a party as a life altering moment. She was a sweet woman who wouldn't say a bad thing about anyone. Or so I thought until, at one holiday gathering, she had too much eggnog and told me I was getting fat. It may have been the abundance of eggnog on both of our parts or I may in fact have been gaining weight. Shortly thereafter, whether to celebrate the holidays or to make amends, Mrs. Parr delivered a dozen of her shortbreads to our house for me. But like any house with numerous siblings, I was told to share the cookies. I would gladly share clothes, boots, or hats, but why did I have to share these? My sister Katie also fell in love with these cookies and stated that they would be perfect with a cup of tea. I have seen my sister drink a lot of things; Canadian beer, water straight from a spring and powdered milk, but I find myself hard pressed to remember a time she ever had a cup of tea. But she is correct. These shortbread cookies require a cup of tea, just as the chocolate chunk cookies are made even better with a cup of ice cold milk. I made these a couple of times. The first time I used my oven on standard before the convection fan was replaced. On standard the scones heated up and melted a bit given the longer time in the oven. I ended up with less shapely scones that weren't very golden - although the flavor overall was reviewed as outstanding! Especially withe the Meyer lemon cured I had on hand from making Meyer lemon macarons. The second time around I was able to bake a batch on convection with much better results. The scones retained their overall shape much better and also browned nicely in the baking time. Into this second batch I added about 100g of zante currants plumped in a little cognac and zest from a Meyer lemon. With the flavor from the fruit and zest these didn't even need any jam, curd, or devon cream - they were perfect on their own. I used standard measurements and a conventional oven for the shortbread and the yield was 24 cookies. The recipe was very straightforward and the result was simply delicious! I had the privilege of tasting one of Leticia's shortbread cookies. I am still salivating from the experience. I want more!!!! Leticia's shortbread cookies were the best I've ever had...and I've had a lot :). Thanks for sharing with me! !